Alexandria “Alex” Nunez is a veteran and former village health aide. Soldier’s Heart Training and learning circles has helped make positive changes in her and her family’s life. Like her sister, family, and many Alaska Native people, Alexandria Nunez served as a first responder in her hometown of Newhalen and served our country in the military. Alex, as she is known, is a Southcentral Foundation health benefits specialist. She helps customer-owners apply for health benefits and connects them with resources they may not know about such as Medicaid, Veterans Administration benefits, and the Tribally Sponsored Health Insurance Program. Alex attended the University of Alaska Anchorage. During a semester off, she joined the U.S. Navy. She was stationed in Texas, Washington state, and was deployed to the Persian Gulf during her military service. After service, Alex worked several years as a village health aide in Igiagig and Newhalen. After a handful of transitions between working in health care related positions and her military service, Alex eventually moved back to Alaska to work for Southcentral Foundation. It was at an SCF veteran appreciation luncheon when she heard first heard about the Soldier’s Heart program — an interactive educational training conference, developed by veterans. The program aims to reduce the symptoms of post-traumatic stress and aid in suicide prevention among veterans, first responders, and their families. The training sparked an interest in Alex. As a veteran who suffers from post-traumatic stress, she began attending the learning circles that provided an opportunity to relate and share stories. It was in the Veterans and First Responder Learning Circle where she learned she is not alone, that others are experiencing the same issues, and that help and resources are available. Having post-traumatic stress has affected Alex and her whole family. Getting help has benefited not only her, but her family as well. They notice a positive difference in her: she is facing her anger and communicating more. Since beginning her journey, Alex has reached out and received help for her PTS. Soldier’s Heart program has had a deep impact on her life. Additionally, she has worked with the Women Odyssey program through Wounded Warriors. Alex and her husband attend a couple’s session. The biggest change Alex has experienced is what her son said to her: he notices a difference in her and their family’s life. 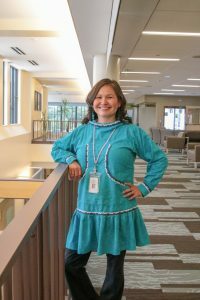 Alex will continue to serve the Alaska Native Community. She has five more classes to complete her physician assistant program and is taking classes online and through the University of Alaska Anchorage. Alex is grateful to SCF for starting and holding Soldier’s Heart. Without the program, she would not be where she is on her road to wellness.